After Hand ninjas (actually it was Lady Bullseye disguised as a Hand ninja) killed a corrupt judge and two corrupt police officers, all of which were on Norman Osborn's payroll, a confrontation between Daredevil and Osborn became inevitable. The news reports that followed were unaware that the victims were corrupt or that the Hand was involved, instead they reported the death of the judge and cops. Norman did not want to allow this type of lawless behavior to occur on his watch...well, he didn't want the public to be aware that this type of behavior was going on under his watch. Osborn wanted order on the streets and after he was informed that it was Daredevil behind this 'act of violence' he could not help but offer his avenger Hawkeye (aka Bullseye) the opportunity to take down his old foe. Osborn instructed Bullseye to kill Daredevil, Bullseye obliged. Bullseye, alongside H.A.M.M.E.R. forces, blasted their way into the Hand's lair, somewhere beneath New York City. He found Daredevil immediately and the two clashed. Their brawl eventually brought them out onto the rooftops and Daredevil was led onto a building filled with innocent protestors (they were protesting the demolition of their homes by Oscorp). The building happened to be filled with explosives as well. With the push of a button, Bullseye killed 107 innocent people and Daredevil could only watch. Enraged by this heartless act, Daredevil swore vengeance on Bullseye and Osborn. To do so, Daredevil turned the Hand into a lethal crime fighting force and Osborn was forced to deal with Daredevil yet again. When Mayor J. Jonah Jameson requested Osborn's help in dealing with a potentially volatile situation in Hell's Kitchen, Osborn decided to not send Bullseye back into the fray. Instead, he sends an entire company of H.A.M.M.E.R. shock troops in to remedy the situation. Daredevil and his Hand followers annihilated the troops, taking almost all of them into their custody as prisoners. 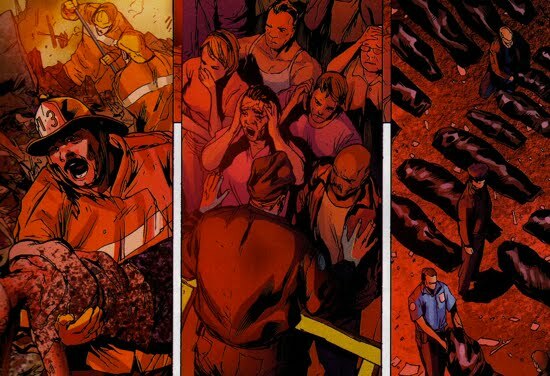 The death of the innocent protestors strengthened Daredevil's resolve to use the Hand as a force of good in the city. Daredevil never got to exact any revenge on Osborn or Bullseye because they were both removed from power before he could do so. After the events of Norman's Siege on Asgard and the fall of his Avengers, Bullseye broke out of S.H.I.E.L.D. custody and Daredevil was there to greet him.